Images of Xiaomi Redmi Note 2 Pro surface? While the smartphone world continues to wait for Xiaomi to unveil its new flagship phone, the Xiaomi Mi 5, images of another new handset surfaced on Sunday. 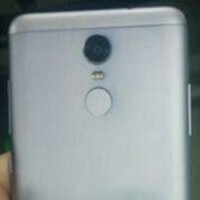 The photographs allegedly reveal the Xiaomi Redmi Note 2 Pro. The metal-clad phablet is expected to be offered in two versions; one will come with a fingerprint scanner and the other one won't. The current speculation has the Redmi Note 2 Pro offering the same specs as the Xiaomi Redmi Note 2, which was released in August. The only difference will be the metal build, and the aforementioned fingerprint scanner that will be found on at least one variation of the Redmi Note 2 Pro. If the rumor is right, and the Redmi Note 2 Pro does share the same specs as the Redmi Note 2, we can expect the handset to come with a 5.5-inch screen, carrying a 1080 x 1920 resolution. That works out to a 401ppi pixel density. The MediaTek MT6795 SoC will drive the unit, which includes an octa-core 2.2GHz CPU and the PowerVR G6200 GPU. 2GB of RAM should be inside along with 32GB of expandable storage. A 13MP camera is expected to be found on the back, with a 5MP front-facing camera ready to snap selfies and handle video chats. A 3060mAh battery keeps the lights on, and Android 5.1 or Android 6.0 will be pre-installed. The Xiaomi Redmi Note 2 Pro will line up against some of the recent value-priced metal-clad phones from competitors like Meizu and Huawei, that include a fingerprint scanner. For example, the former last week unveiled the Meizu Blue Charm Metal with an aluminum build, and a fingerprint scanner, all for less than $200 USD. How many times PA will post same images again and again. the chinese consumers are really having alot of great smartphone deals! Why do all these OEMs think those.plastic filled antenna gaps, look good on a phone. It didnt look good on the HTC One, it doesn't look good on the iPhone or no other phone. I am so glad Samsung did something different. No lose in call quality and phones with them don't sound any better. I rather you gave the back some texture or keep it a solid. But the gaps gotta go. I'm glad someone else shares my opinion on those ugly antenna lines. What I wanna know is why Xiaomi's battery pack always the same on every phone, lol. I prefer the Meizu metal, but damn it seems like both companies are going at it now.